As you can see by the numbers, inconsistent. One even goes down as you increase. Even if the inconsistencies were intentional, I really want to know the thoughts behind why they were set that way. To me, it makes no sense, and severely skews the outcome of resources that appear. Of course, my money is on that they just screwed up. I have asked the producer about this... I will post when I have something. Thanks for this post. Ill switch Uncommon Nebula from 0.07 to 0.03. That one definitely didn't get updated. What is the issue with the others? Are you expecting that jumps would always be linear? btw: PlanetFrequencyExp of None looks wrong at 1.0. But you can't select None for PlanetFrequencyExp so that value isn't used. One would think they would be more sequential. The way they are at the moment, they can feel like one step is no different to another. Are you saying that it is odd that the jump from occasional to common nebula is 0.05 while the jump from common to abundant is 0.02? ie: that the breaks are sequential, but that the gaps aren't always linear? Sorry, yes more linear, Asteroids for example Rare and Uncommon look/feel the same in game. The habitable planet settings also. I don't no why and no matter which values are in this sheet. 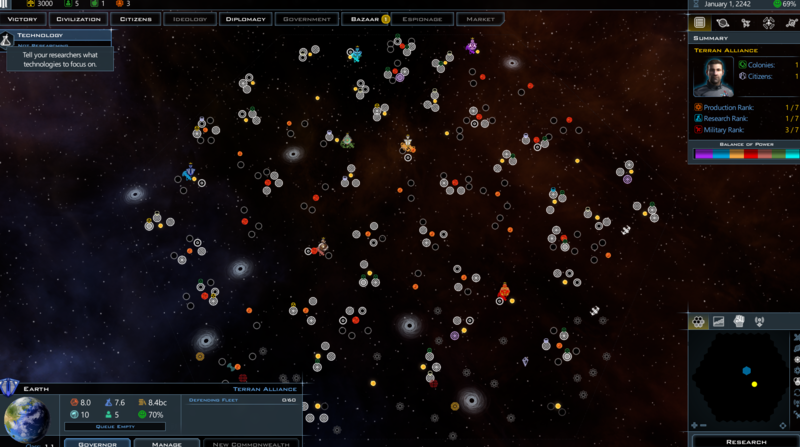 In game you have only with all setting at abundant a couple of habitable planets. All other combination of number of stars, number of planets and number of habitable planets feels in game ever at the same. You have got nearly none habitable planets. There is nothing between "very much" and " against zero"... No matter which setting combination. I see what you are saying, I'll play with it. Thank you for the feedback. This is what I've been playing with and it's working out pretty well. I also found an issue constraining the amount of habitable planets in another file (so no matter how frequent they were here you wouldn't get any more). I tried to take advantage of each setting to give players the most customization possible. I'll keep playing with it and get these in for 3.03. Thank you Horemvore for posting this. I've been feeling that something was wrong with these settings in 3.0 and 3.02 but I haven't had the time to check it out - Karma to you. 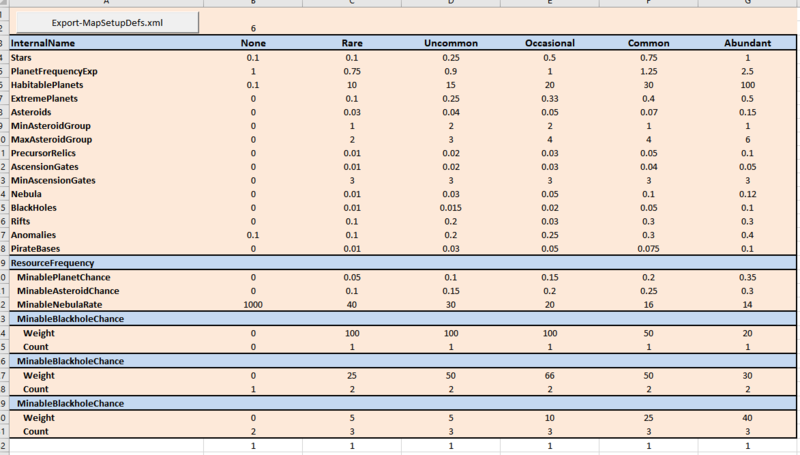 Are the formulas behind the settings of a linear character (e. g. Stars: 0.1 at rare, 1 at abundant, does that mean abundant has 10 times the number of stars)? And while you are at it: can you make the nebulae bigger (not just 10 or 20 hexes, but 100 or 200)? An option for nebula size would be great, but since I think that is out of the question now it would suffice for me if the chance for bigger nebulae would increase with abundance. There seems to be a limit with StarSystems, no matter how many you set MaxPlanets too it caps out at 3 per system, there are infact random systems in the StarSystemDefs.xml calling for 4 - 6 Planets but they never appear in game due to the cap, they come out as 3 planet systems. Kudos to you for looking into this. Much appreciated. The issue that was constraining me was the MaxHabitalPlanets in MapSizeDefs.xml. (ie: no matter how likely i made habitable planets it was hitting this limit and not placing any more). Yes it is moddable. I increased it for most map sizes so we can get into those ranges if that's what players have their settings for, but I didn't do it at Insane map size (which was already a high limit) because more colonies means more cpu and more memory cost and I want player to be able to finish games. Great! ! The not working galaxy settings were the biggest bug for me! It looks really good and I'm really happy that it will fix after a soooo long time. To me that looks more like abundant/abundant should be. I might have to turn down my settings a bit though. Exactly ! But if abundant works I have a big hope that all other settings also works an to play with it in game will create what you really want!